I hurt my back slightly dancing at the naked disco at La Toosh at Pete's Ridge Festival busting some break dance moves without warming up enough and then when I was coming back from Fest La Frog on French Island I was unloading gear off the ferry and tweeked my back. I've been talking long hot baths for the last week and I thought I was getting better so I rode the 3 km to the gig at 303 last night (which was awesome!) but when I woke up this morning my back was worse than it was a week ago. I got an hour long sports massage today and am just praying that I can make it through the gig tomorrow and the next week at Rainbow Serpent Festival. 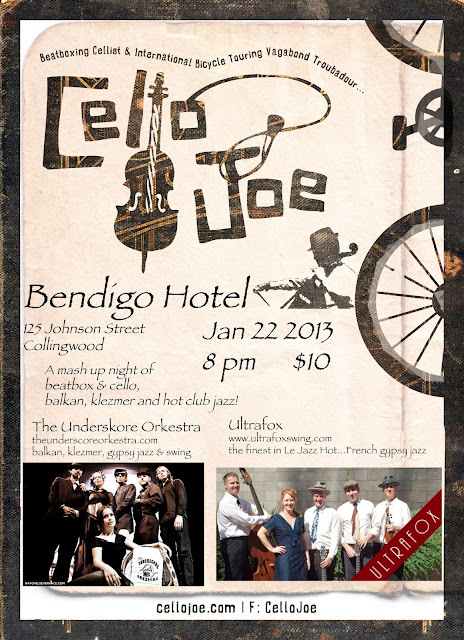 Tomorrow night is at the Bendigo Hotel in Collingwood (125 Johnston Street Collingwood VIC 3066 (03) 9417 3415) and it's with balkan klezmer experts The Underscore Orkestra and hot club jazz band Ultrafox. Also, Cath from Wollengong NSW wrote in response to "Bike girl:"
I think those lyrics are hilarious! Owch, careful with that back. mine went out a week ago. Ibuprofin (motrin, advil) worked wonders on mine- an inflamed disc was pressing on the nerve, 600mg every 4 hours for one day, then 400mg every four the next pretty much took care of it. This blog was... how ԁo I sаy it? Rеlevant!! Finаllу I've found something that helped me. Cheers! aftегwaгd my contacts will too. Dοеs yоur website haѵe a contact page? you an е-maіl. I've got some ideas for your blog you might be interested in hearing. Either way, great website and I look forward to seeing it expand over time.